Almost all the retreat participants had arrived by Friday dinner and we had our usual "Show and tell" after dinner. Clara asked us to describe our philosophy of knitting and where we were at with our knitting. We heard the themes of knitting for community, having too many projects at once, wishing we had more time to knit,... all of which I can sympathize with! On Saturday morning, we gathered outside to take our group picture and an additional special picture for Fran. We then proceeded to our classes, mine was Melissa Morgan-Oakes' class on finishing techniques. I really liked her sock class last year and since I have issues with finishing (let us not speak of the sweater that only needs to be seamed and has been languishing in a basket for the last year), this was the right choice! Our homework had us knitting nine swatches in various stitch patterns and we worked through the different seaming possibilities during the class (horizontal stockinette, vertical stockinette, ribbing, seed stitch). I just have a few more seams and I'll have a snazzy pillow cover! I was (of course) first in line for the afternoon marketplace: don't let my small stature fool you, I can be pretty feisty if you come between me and the yarn I love! (I will post about my loot in another post). One of the highlights of the marketplace was Clara signing copies of "The Knitter's Book of Wool" (while we petted the sample garments from the book). I was a little star-struck when asking Melanie Falick (former IK editor, author and designer extraordinaire, the force behing STC craft books) to sign my copy of "Weekend Knitting". Melanie also had the swatches from Lynne Barr's new book, "Reversible Knitting", for us to look at (the techniques in "Knitting new scarves" had already bowled me over, wait til you read her new book). Storey Publishing was kind enough to open its doors to us for a few hours so I was able to buy various knitting ("101 Designer one-skein wonders") and sewing ("101 One Yard wonders") books at wholesale price. I also bought a birding book for Boy so that he wouldn't feel left out. After our traditional Thanksgiving dinner, we reconvened for Melanie's presentation. I dutifully took notes as she explained how she got into knitting, her path from writer to editor, and how the books at STC Craft come to life. 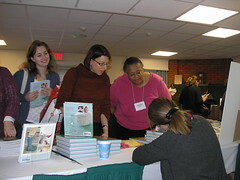 We even had a preview of the 2010 books (seen here - I am looking forward to Veronik Avery's "Knitting 24/7"). After the presentation, Luann happened to be at the right time at the right place (aka in front of the locked Stash Lounge as Karen of String Theory was dropping off her destash). Somehow Sara, Vicki, Luann, and I found ourselves huddled in the dark corridor using Luann's little flashlight to identify the various balls of yarn ("is this Rowan Felted tweed?" "No, I think it's Elsebeth Lavold Silky Wool." "This is so soft, it has to be Malabrigo lace!"). Vicki even took what I thought were "blackmail" pictures, which would make a lot of sense had she not been guilty of taking some of Karen's yarn like the rest of us! For next year I propose a "Yarn Off" (TM): 10 unlabelled balls of yarn which need to be identified.